Film Night in the Park is San Francisco's premiere outdoor film series. 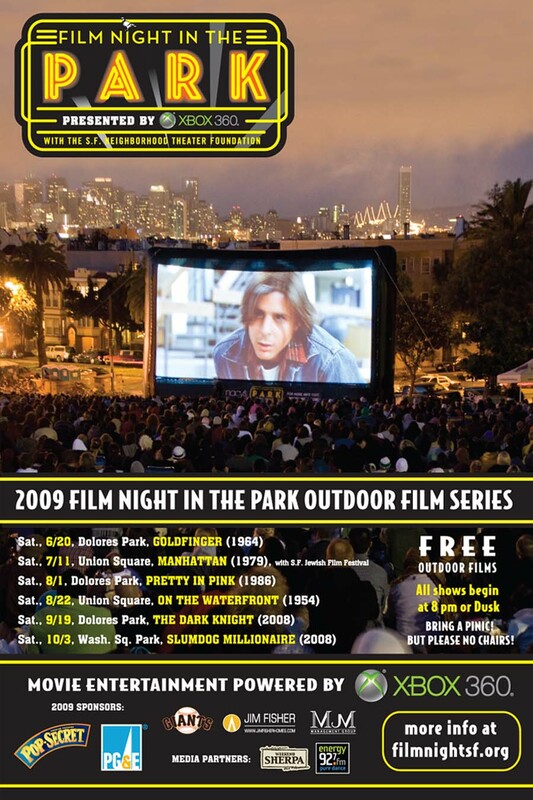 Eight film night screenings in 2008 were attended by over 15,000 film-goers with over 7,000 attending the July screening of 16 CANDLES in Dolores Park. Over 65,000 people have attended Film Night in San Francisco since 2003. Films are presented free of charge on a giant outdoor screen in beautiful park settings. Attendees are encouraged to picnic before screenings and are discouraged from bringing chairs. Sponsorships are still available for Film Night in the Park 2009. Join the generous family of corporate and neighborhood sponsors who make Film Night possible. For more information click here or call (415)465-3456. Guests are encouraged to walk, bicycle or take public transportation to all Film Night in the Park screenings. Valet bike parking is provided by the San Francisco Bicycle Coalition at most Film Night in the Park events (check www.sftntf.org for details). Washington Square is located at the intersection of Columbus and Union Streets in San Francisco's North Beach neighborhood. The Park is served by MUNI bus lines 15, 30, 45 and 39. The Powell/Mason Cable Car line stops one block from the Park (at Union). Union Square is bounded by Powell, Post, Stockton and Geary Streets in San Francisco. It is served by all MUNI Metro lines (Powell Street Station), by BART (Powell Street Station), and by multiple MUNI bus and cable car lines.